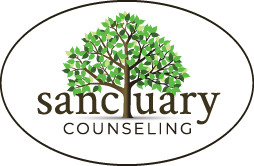 Author: Timothy Reider | Sanctuary Counseling, LLC. When people ask me to explain how play therapy for children is supposed to be similar to talk therapy for adults, I find myself drawn to explain how intuition develops with age. Do you remember nostalgic days of recess playgrounds and backyard pretend? When kids are roleplaying superheroes or re-enacting scenes from their favorite movies, it’s easy to say as an adult “wow my kid really wants to be like Elsa”, when it’s more accurate to say “right now, they are Elsa”. If you’ve ever acted in a theater class or have watched a play, you probably already know about suspension of disbelief. It’s the point where we can “turn off” being analytical to just stay in the present and bear witness to something very human. That state of mind is what I’m confident is to say is a human need, if not the beating heart of the humanities. Kids live in that world. The purpose of play therapy is to basically give fresh canvases to people who are basically spinning engines (sometimes literally) of art and creativity. My role as a therapist here, is to step more into being the narrator or the audience beholding some new work, and to reflect back what we see from the young artist in the room. And yes, this also totally happens during board games. Sometimes, I bear witness to kids sabotaging a board game so they don’t win, because they don’t want the game to end (“I want everything to be fair! All the time! Forever!”). Sometimes, I bear witness to a tea party where the poor host is getting burnt out trying to serve tea to someone who snubs them ruthlessly (“If I do this for her, then maybe she’ll notice me, someday…”). Sometimes, I witness royalty build the castle walls higher and higher, hoping to both fortify a tower so mighty only to recognize if they move slightly the pillows they’ve used will cause their fortress to crumble (“I need to be safe! It’s too uncomfortable out there!!”). Each of these is a conversation, and sometimes my role is to bear witness to it in enough ways that we can notice more of the story happening live, together. This process is identical when I work with adults who are creative. I’m always eager to see people’s sketchbooks if they are willing to invite me into bearing witness to it. Sometimes, motifs and patterns emerge visually. Someone who draws the mysterious character whose left eye can never be seen. Someone who finds themselves drawn to always include red-violet somewhere in their work. Someone who would punch clay to make a mold of their fist to then fire it and then adorn it with floral patterns. The goal is the same. We live in this world to make meaning, somewhere. Some meanings are more obvious than others, but the journey of having the conversation together as artist and audience is what makes these forms of art expressive art. All of this I believe pays greater service to how we nurture intuition. I can only speak to this rooted in the context of the time of this writing, but culturally the more we value what is directly measureable, the more we feel drawn to “prove”. I think this grinds against some of the deeper value of the work. Therapeutically when we have to access intuition, the purpose isn’t to immediately “fix” something. What is there to fix? The art and expression above already exist in the world. In these moments, it’s more about bearing witness or companioning the work to honor it, or being the keeper of a story. Whether as an adult or child, the way we express ourselves deserves to be honored and heard. Ultimately, it’s a human need that, when met, allows us to reflect and become something more. And to be candid, takes a big leap of trust! That’s why a lot of our most important depth thoughts about ourselves, or works-in-progress, are rightfully worth protecting while they sleep. I also don’t think the conversation necessarily stops here! If this resonated, I’d love to hear what came up for you. I can be reached at timothy@sanctuarycounseling.com. Can You Actually Connect With Your Kids Through Video Games? Sooooo your teens are probably playing a lot of video games. Do you feel like you don’t understand the appeal? Is your kid obsessed with some games and you don’t know how to connect? Kids find and share meaning through play, and those languages remain important even as we get older. I play a lot of video games myself, and I often times find myself playing interpreter for parents as a therapist to translate. Here are the kinds of language I notice that are used by kids to explain how they play. Start with the outsides of things. If there’s obvious characters that your kid interacts with, ask them about why they like that character. 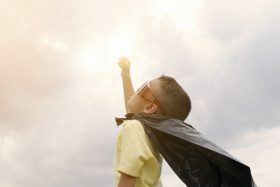 If they start talking about their personality, how they behave, and how they relate to other characters, your kid connects with a style of “projective play”. They really love getting into stories and pretending to be a character. These games can include elements of fantasy, science fiction, and mystery. Your child might spend a lot of time thinking about people. If your kid talks about the mechanics of the game more than the character (“They jump higher! They do more damage! They have the most powerful move in the game! !”), then your kid might also like the style of “competitive play”. This is usually a game that has a very obvious way to win or lose and usually very clear boundaries within the game. 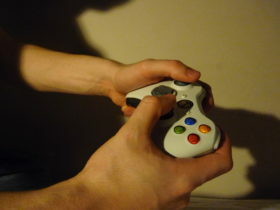 War shooters, sports games, and fighting games tend to have their own spectator audience online, so you might find your teen spending time looking up strategies and watching matches not unlike more traditional sports. Ask them if there are other people who play the game really well that they know about. Your child might really connect with a “coach” mentality in this sense, and might get stuck when switching between competitive mode and people mode. If your kid talks about the environment (“Check out this cool castle I built!” “Here’s my house where I keep my one million pet monsters!” “My friends and I built this fortress!”), then your child might enjoy the style of “expressive play”. Your child wants you to explore what they’ve made to learn more about them or their friends group. Absolutely let them be your tour guide to their world. Ask them how they would live or move in that space (or who/what would live there). These styles can pair well together and are not single note flavors. There’s no truly wrong way to play a game, but above all else I encourage every parent to talk to their children about what their kids are looking for in their play experience. Take note of HOW your child talks about how they feel before and after they finish a game. What kinds of conversations do you hear happening? I’d love to hear them!